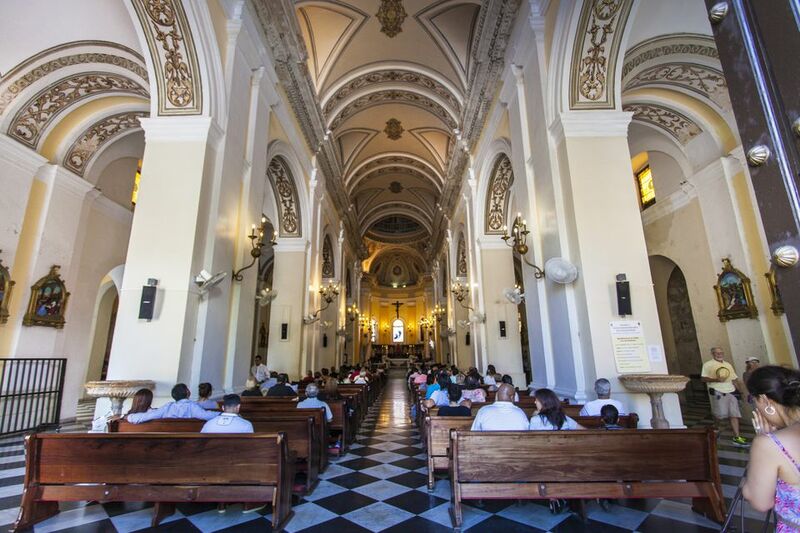 The graceful Catedral de San Juan Bautista, or Cathedral of Saint John the Baptist, is a can't-miss historic landmark in the heart of the old city. The church is located at Calle del Cristo #151-153, just across from the beautiful El Convento Hotel. There is no admission fee beyond an optional donation. You can attend mass on Saturdays at 7 pm, Sunday at 9 and 11 am, and weekdays 7:25 am and 12:15 pm. The church is open daily from 8 am to 4 pm (Sunday until 2 pm). If you happen to be in Puerto Rico over Christmas, try to attend the Misa de Gallo, held on December 24 just before midnight, so you can see enactments of the Nativity scene and the catch the cathedral decorated in all its Christmas glory. Old San Juan's venerated cathedral is Puerto Rico's grandest religious building, and one of its most important. In fact, San Juan Bautista is the seat of the Archdiocese of Puerto Rico. It's also the second oldest church in the Western Hemisphere, and the oldest church on U.S. soil. The history of the church dates to 1521 and the earliest beginnings of the Spanish colonization of the island. The building you see today wasn't the original church, which was demolished by a hurricane. The current structure dates to 1540. Even then, the elegant gothic facade that you see today evolved over centuries. The cathedral has also been through its share of trials and tribulations. Over time it's succumbed to numerous robberies and pillaging, most notably in 1598, when troops under the Earl of Cumberland (who famously launched the only successful attack on El Morro) sacked the city and looted the church. It's also had its share of weather-related wear and tear, especially in 1615, when a second hurricane came along and took off its roof. Its location on Cristo Street is no accident. A short walk from the San Juan Gate along the Caleta de las Monjas it was the first stop for many travelers who landed on the island and walked into the city through its only seaside entry. Sailors and travelers visited San Juan Bautista as soon as they got off the boat so they could thank God for a safe voyage. As beautiful as it is, the cathedral is also famous for two famous reliquaries (it once boasted many more treasures, but the repeated theft and damage has stripped it of much of its original finery). The first of these is the final resting place of Spanish explorer Juan Ponce de León, the first governor of Puerto Rico and the man who cemented his place in history when he went chasing after the Fountain of Youth. Ponce de León may not have spent too many years here (his family, however, lived in Puerto Rico at the Casa Blanca), but he remains a legendary figure on the island. His remains were not always at the Catedral. Originally, the famed conquistador was interred up the street at the Iglesia de San José, but he was moved here in 1908 and placed in the white marble tomb you see today. The cathedral also houses one other distinguished and long-deceased figure. Look for the wax-covered mummified remains of St. Pio, a Roman martyr killed for his faith. The saint is encased in a glass box and makes for a somewhat eerie spectacle.